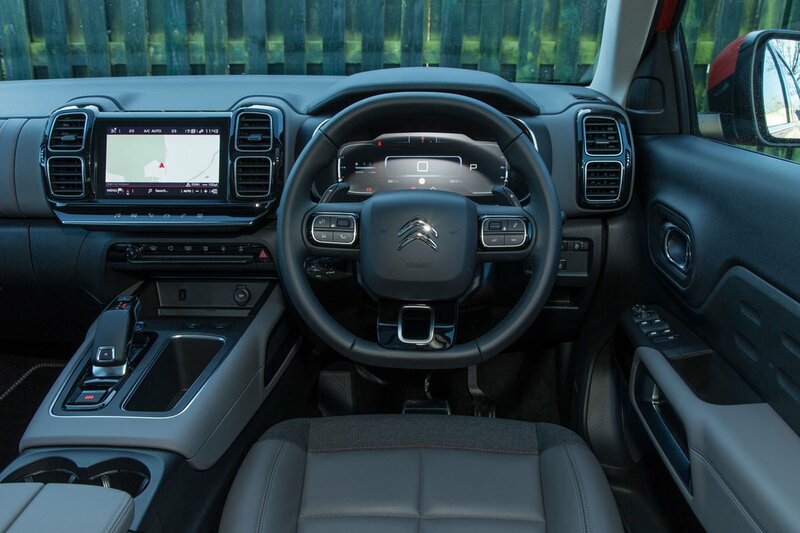 Citroën C5 Aircross Interior, Sat Nav, Dashboard | What Car? The driving position is neatly set up with the pedals aligned with the seat and steering wheel. There’s plenty of adjustability to the seats, particularly if you upgrade from Feel to Flair trim to gain seats developed under the same Advanced Comfort programme that inspired that clever suspension technology. They’re made with 'high-density foam' to create ‘lounge-like’ comfort, which may seem optimistic, but they do indeed offer a very enjoyable place to sit, and they come in a choice of luxury-feeling, leather-trimmed finishes. In terms of the controls, it’s a shame that so much, including the climate controls, has to be operated through the 8.0in touchscreen; it’s fiddly to use on the move and you can’t steady your hand while trying to hit the icons by resting it on ridge below the screen – that’s home to a row of touch icons that swap between the various sat-nav and music menus and are all-too easy to operate by mistake. We rather like the 12.3in digital instrument display, though. This takes the place of regular analogue dials and can be customised to bring up lots of information, including sat-nav mapping. In terms of offering a good view of the world outside, the C5 Aircross is okay; its windscreen pillars aren’t overly thick, but it’s less easy to pick out what’s lurking at both rear quarters than cars designed with a more open glass area, such as the Peugeot 5008, Honda CR-V and Skoda Kodiaq. But these days it’s not just about what you can see first hand and helpfully, all versions of the C5 come with rear parking sensors. If you treat yourself to a mid-spec Flair model, you get front sensors and a rear-view camera as well. It has to be said, though, that the camera’s image isn’t as clear and easy to interpret as some rivals'. Disappointingly, you can't have LED headlights, even as an option. 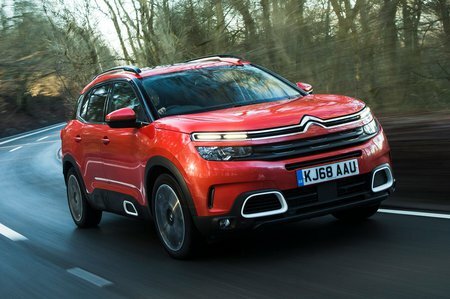 All versions of the C5 Aircross come with DAB radio and Bluetooth, as well as Apple CarPlay, Android Auto and MirrorLink smartphone mirroring on an 8.0in touchscreen. Move up to Flair trim and you get inbuilt sat-nav as well as voice recognition. You also have the option to add wireless smartphone charging. The touchscreen is positioned reasonably high up on the dashboard. It has reasonable clarity and decent graphics but doesn’t look nearly as good as the ultra-clear display you get in the Skoda Kodiaq. It’s not as good to use, either. Problems arise when you use the sub-menus, because some of the smaller icons are tricky to hit while you're driving and there’s often a delay while the system processes your commands. We prefer the responsiveness of the Kodiaq’s system or, instead of prodding a touchscreen, the CX-5’s less distracting rotary dial controller. The standard stereo comes with six speakers, and, unusually, there’s no option to upgrade for all you discerning audiophiles. 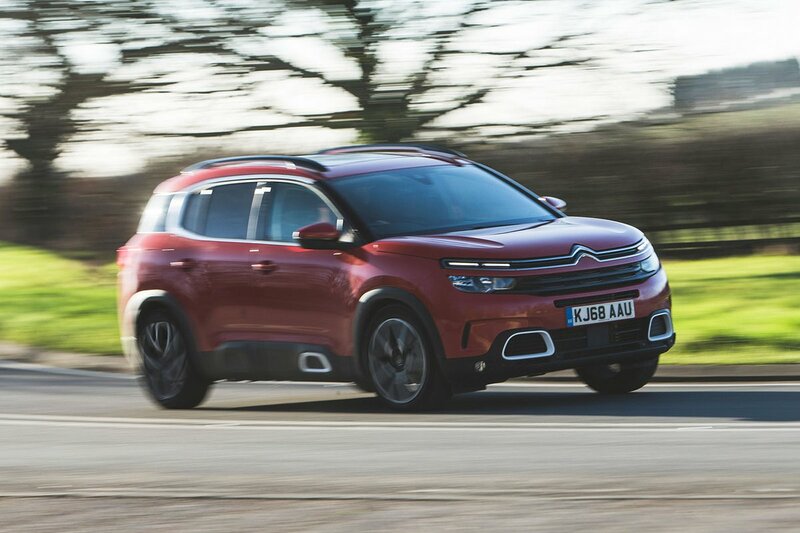 Were we to base this section on looks, the C5 Aircross’s rather appealing design might score quite well. But we don’t, because judging looks is your prerogative, not ours; we’re all about the function and feel of fixtures and fittings. Step inside and you’ll find are plenty of soft materials, including leather-look finish to the dashboard with matching accents to the steering wheel and gear knob gaiter. However, while gloss-black fascias around the air vents and centre console lift the perceived quality, it’s let down by the scratchy fabrics on the door and down by the gear stick. Most of its rivals have classier materials that deliver something more akin to a premium feel. The Peugeot 5008, for example, manages to look cool and, importantly, backs that up with more substance.